The Widnes Wild ladies team put on a battling display in their first home game of the season but ended up losing 1-2 to the Milton Keynes Falcons. The Wild actually scored first in the 2nd minute but the goal was disallowed by the referee and insult was heaped on injury as the Falcons immediately went down to the other end and scored for themselves. The game was very close with chances for both sides but then - in the dying seconds of the first period, the Falcons scored again with a breakaway goal that gave them a somewhat flattering 0-2 lead going into the break. Widnes fans finally had something to cheer in the 27th minute when former Belgian international player Leen De Decker scored a fine solo effort to get the Wild back in the game. Things began to get physical as the second period wore on and the Wild started pressing for an equaliser. They began clocking up penalty minutes but, despite being short-handed on numerous occasions, they managed to defend their net and looked most likely to score again. The third period remained goalless and was a very tense affair throughout. The Wild pulled their netminder for the last minute of the game to throw on an extra attacker in an attempt to force a late goal but to no avail. 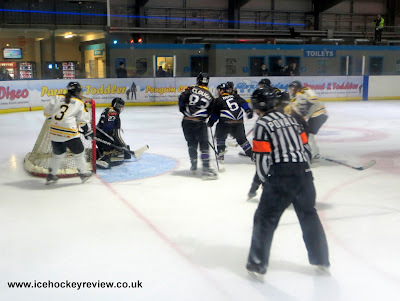 Overall, the Wild outshot their opponents by almost two to one (41 to 22) and the MK netminder Kayleigh Doyle played a blinder for the visitors. The Wild Women have now played 4 games in their Women’s Premier League campaign this season and have won two and lost two. They are in action again next Sunday in a home game against Slough Phantoms – who they beat 3-4 away in the first game of the season. The match starts at 5.30pm and admission is free.